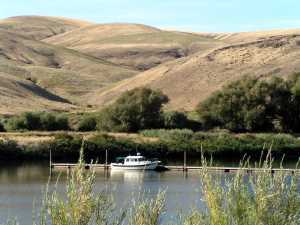 Launch: Hells Gate State Park in Lewiston, ID - good ramp and fenced parking for the vehicle and trailer. 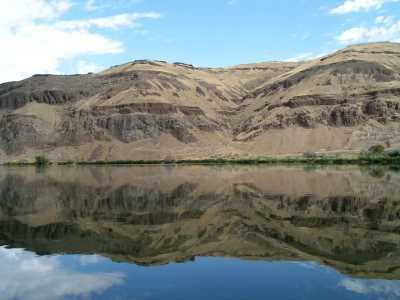 Nearby campsites: In the State Park - near town, good pull-through sites for the boat on the trailer. Comments: Lewiston is a great little town. It has almost everything you need, "right on 21st street." Don't miss the Grill downtown for a great Reuben. 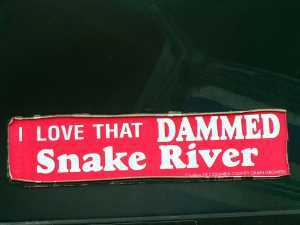 ------The Snake River is the seventh longest river on the continent. We have canoed its headwaters beneath the Grand Teton and splashed rapids through the Snake River Canyon near Jackson Hole, Wyoming. We have dumped, twice, in its upper reaches - good memories and entertaining tales for grandkids around the campfire. It is a wonderful and beautiful river. 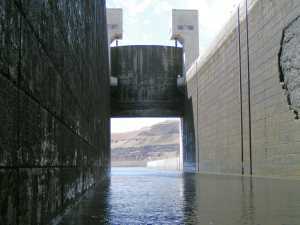 The lower 145 miles, from Lewiston, Idaho to the junction with the Columbia River near the Tri Cities, is maintained as a commercially navigable waterway by the Corps of Engineers. This bottom stretch of the river is as beautiful and interesting a river to cruise in a small boat as the headwaters are to raft. 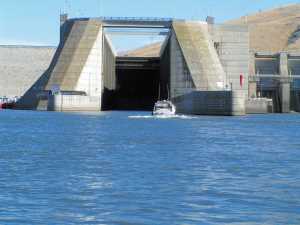 ------There are four locks on the navigable Snake - and each is an adrenaline rush. El and I had a friendly competition to see whose heart was thumping loudest as we approached the locks. 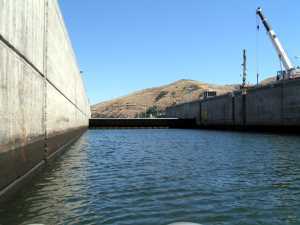 Each lock is a little over one hundred feet of drop/lift. 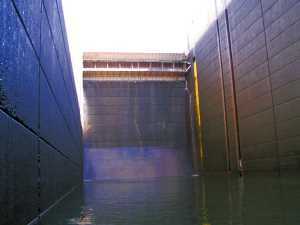 Enclosed deep within the dripping darkness, in the maw of the lock, is an intimidating but marvelous experience. Daunting - We Go Into There? The Sign Up There on the Right Says "Lose Hope, All Ye Who Enter Here"
------We have been through a little over two hundred locks with Halcyon, but no two are ever alike and each has its own characteristics, its wind, and its current. 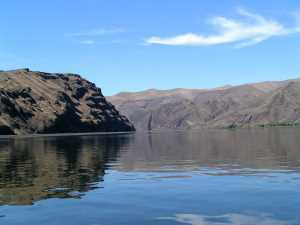 Upriver, sometimes on the same rivers we have later locked through in their lower stretches, we have also paddled through rapids, in canoes, kayaks, and rafts, some of them many times, but never are they exactly alike either. ------"People are the same way," El said when we were discussing locks. "Everybody is different. Each of us has our own history, our own stories to tell. Every lock is different, even when they look superficially alike." ------"But, how come a single lock is different every time?" I protested. "Certainly, there should be some consistentcy in the behavior of an individual lock." The scientist in me always looks for replicable patterns. ------"You, Bill, are never the same every day," came the quick answer from El. "Before and after coffee, rested or tired, hungry or stuffed - you are always different depending on different conditions. 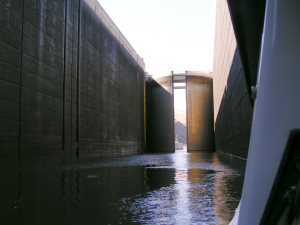 With a lock, it's the wind, the individual operator, the current, how we handle the boat and the lines - there are so many variables that the locking experience is never exactly the same, even in the same lock. Every time through is unique. Unique! - that's what makes the heart thump and keeps life exciting. That's what I love about locks, each is special"
------"And," I added, "- that's what I love about you." 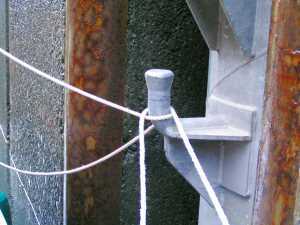 ------The instructions at the lock gate say to tie to a bitt on the bollard. DON'T TIE! One person heads to the bow and cleats a line to the bow cleat of your boat. The skipper manuevers the bow near the bollard, the bow person passes the line over the bitt on the bollard, and holds the line. Then with the boat still sliding forward, the skipper heads to the cockpit, loops a line cleated to the aft boat cleat over the bollard, and stands in the cockpit holding its free end (after making a dash to the controls to turn off the engines since exhaust is not nice in the confines of a lock). Then, down (or up) you go. 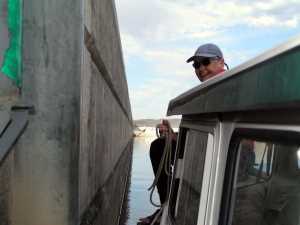 ------After completing the lockage, with the gate open ahead, and at the radio command or one hoot from the lockmaster, you start engines, each lifts their line off the pin, and 'away we go'. 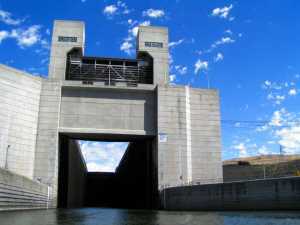 ------There are those who would have the dams removed from the Snake River. Reasons are many, but they basically boil down to returning the river to a natural state where wild salmon can run free to the headwaters. 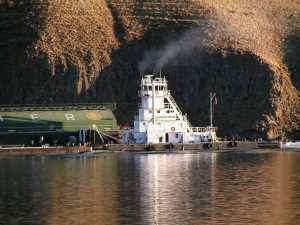 Economically, this would be difficult since barges haul grain and other commodities efficiently. 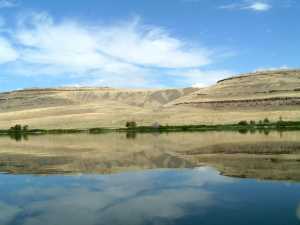 Also, the water diverted from the reservoirs is used extensively for agriculture, particularly wheat-growing. 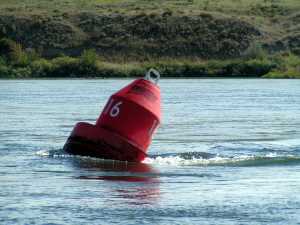 ------We passed several tows a day during our journey. The skippers here are as skilled and professional as anywhere we have met them. They are the eighteen-wheelers of the waterway, and we admire and respect them and their lives. 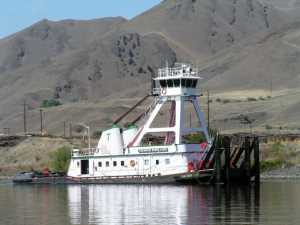 We have written about towboats if you wish to learn more about their lives on the river. 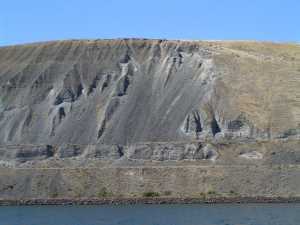 -----The geologic story of the Snake is summarized in our story, Columbia Rocks. There we talk of the awesome results of colliding geologic plates. Here, on the Snake, the evidence of collision is more subtle. 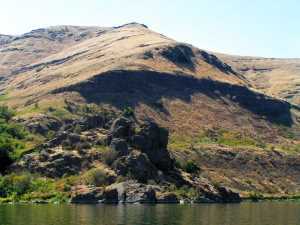 The picture below shows a tumble of rocks near the shoreline that don't show the bedding of the overlying lava flows. 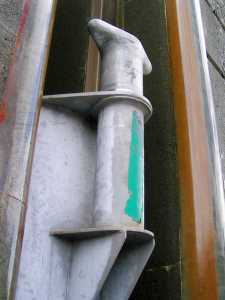 It is a small granite plug, that intruded through a punctured crust during plate collision. This chunk of granite gives the name to the next dam downriver, Lower Granite Dam. 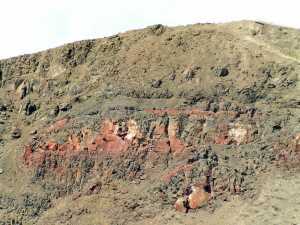 ------The tales of geologic fire are written in the canyon walls, layer upon layer of lava flows. 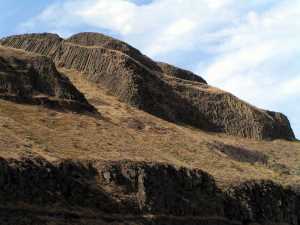 The basalt sometimes freezes into prismatic columns, looking like black cordwood stacked vertically. ------The stretch of the Snake below Lower Granite Dam has some huge piles of glacial debris carried by the floodwaters from the breaking ice dam of Lake Missoula. 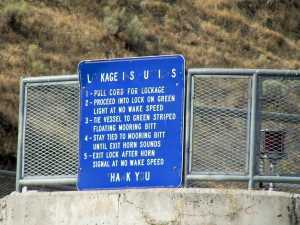 ------We really enjoyed our trip down the Snake. The weather was perfect, the scenes varied, the wildlife easy to spot, and the many coves and parks to tie off or anchor were magnificent. The highway soon leaves the riverside, with only the occasional train or rancher's pickup along the shores. This is one beautiful river. ------Twilight is a special time. The business of the day slowly winds down and calmness seeps into the landscape. Halcyon was alone at the dock as El and I sat in the cockpit, quietly chatting. The light in our cove slowly turned down until we sat in the cool shades of dusk. 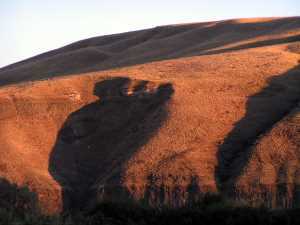 Hills surrounding us turned a ruddy brown, and shadows lenghened in the coulees. A family of beavers were creasing the calm water in the cove with their V-wakes. The young 'uns chased each other in the water and bullied each other away from especially succulent twigs on the shore. The adults looked on with apparent calm disdain, as parents of teenagers usually do. A Great Blue Heron merged its lanky figure with the top of a piling and surveyed the scene with indifference -sometimes indulging in an amusing fit of scratching. A Great Horned Owl mournfully called from the dark trees ringing the cove. We sat in silence, as we often do, witnesses to the amazing transition from day to night. ------The Hopi believe our ancestors surround us, if we are aware. The shape of a cloud, the form of a tree, the profile of a stone pillar all may represent the spirit of the old ones. As the owl cried his mournful lament, we watched the spirits shape the shadows.